General installation instructions can be found from this page. 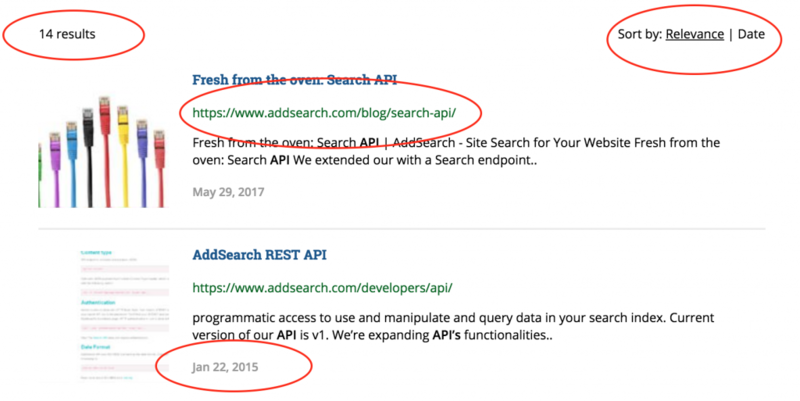 Here’s an example of search results with the number of results, visible URLs, publishing dates and a possibility to sort by date or relevance. The setup shown above can be defined with the following settings. link_target _blank, _self, _top, _parent Window or a frame where the clicked results link should open. E.g. _blank to open links in a new tab. To submit the search field on search results page, call the following function. With dynamic category filters, aka faceted search, you can let your users filter search results in real-time. In the example website you can filter our search to /blog or /support paths. submitAutomatically By default, search results are refreshed automatically when the category function is called. If submitAutomatically is set to false, you need to call addsearch.submit(); function manually to refresh search results with new filters. When the checkbox above is checked, search results are limited to /news/* path. When the checkbox is unchecked, all results are returned. See the full documentation of Category filters. With range filters you can let your users filter search results in real-time to meet a range criteria. Add a filter. You can filter against different fields, or add the same field multiple times with different values. autosubmit: Should search results be refreshed automatically? Default: true. Set to false if you manipulate filters with multiple function calls. Remove a previously added filter. Set specifically defined list of filters. Clears possibly previously added filters.